Italian Wine Chiller keeps white and sparkling wines chilled for hours. Just specify a chateau name (up to 18 characters) and vintage to create a wine chiller that will be adorned. Note: Personalization can be for the Chateau Name, up to 18 characters including letters, numbers, spaces and special characters. Font, font size, font color, the word "Chateau", and graphics can not be changed. Size: 6-3/4"H x 4-3/4" Dia. Imprinted items must be entered in quantities of 1-ea per line - per personalization. How does a terra cotta wine chiller keep the wine chilled? BEST ANSWER: Thank you for your question. Wipe the interior of your terra-cotta wine chiller with a damp cloth or paper towel to remove dust, dirt and debris. Fill your kitchen sink with cold water. Dip the terra-cotta wine chiller into the water, and soak it for 20 minutes. Make sure the entire wine chiller is submerged in the water. If it will not fit in your sink, soak one half of it, then turn it upside down and soak the other half. Put the terra-cotta wine chiller in your freezer for 20 minutes or in the refrigerator for an hour. Layer ice on the bottom of your wine chiller. Although you can skip this, it will help chill your wine even faster. Put your wine bottle into the terra-cotta chiller. Wait 15 to 20 minutes, and then enjoy your wine. You can keep the bottle in the chiller throughout dinner or while entertaining you guests, and it will stay chilled. Any other questions please call us at 1-800-356-8466. You soak the terra cotta wine chiller in cold water for about 20 minutes. The terra cotta absorbs the cold water and will keep the wine cold this way. Can I get this item without personalization? I would want it plain. Yes, we bought them as thankful gifts for our groomsmen, with no personalization but that was over 15 years ago. 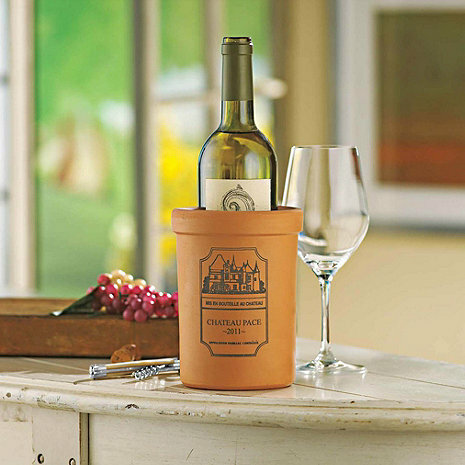 The Personalized Terra Cotta Wine Chiller does not come without the personalization. I ordered this as a gift for some friends and had it personalized for their anniversary to go along with a great bottle of wine. It was a nice keepsake and they were thrilled! Great gift idea -- inexpensive, but still very special. This is a wonderfully unique present for the couple that enjoys wine! It is personalized with the last name and year. I've given this as a wedding gift numerous times after receiving one myself. Every couple truly appreciated the thoughtfulness of this gift. The only downside is that it does not accommodate anything other than a standard wine bottle. The engraving is light and hard to read. There was no confirmation on shipments. The items were packed very nicely so they did not break. Customer service did not provide feedback on delivery. I had ordered the Personalized Terra Cotta Wine Chiller as a gift for my son and his fiancée. They absolutely loved it! It arrived quickly and packaged very well. Perfect for that unique housewarming gift. I purchased this product for my father for Father's Day and he loves it! Perfect gift for a "wine enthusiast". This wine chiller keeps white wine cold for many hours and it looks great. We love it. My Daughter absolutely loved this item. Great design & quality.Great for a gift. I would recommend this product to any wine drinker that like to entertain inside or outside. I purchased as a gift for friends. Nice product. Small print, personalization could have been done in a larger font. The print customization is great! But the print could be much darker. It almost looks faded. But, all in all a nice gift that is not too expensive. I would have given it a 3.5 stars if I could. This was almost what I was hoping it to be. The printed design was fine, but there were flaws in the chiller its self. It is an uneven color--which is fine--however I was really disapointed that the design pressed into the pottery before being fired (a bunch of grapes) was only half there. I was upset as this was a gift to someone with no time to get it replaced. If you are not a picky as I am I would recommend this, I remain disapointed in the item. I ordered a wine chiller as a wedding gift that was to be personalized. The first one showed up and the personalization was not centered. It was obvious that it was not put on correctly. Called to have replaced-it was, but when the next one showed up, the personalization again was not centered! This is a wedding gift that has to be perfect-and twice now it looks as though someone was drunk to personalize it and sent it out without any quality control! Worst online shopping experience ever. Fortunately, the CSR-Cynthia-has been very helpful in getting this resolved.